Don't Miss: Dark Explorers Brrrrrrr, it's cold up here... and so, so dark. In January, two explorers set out on a hike... and they got a little carried away. 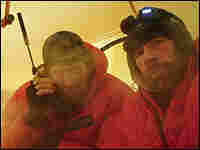 Borge Ousland of Norway and Mike Horn of South Africa set out to become the first explorers to trek to the North Pole during the dark winter months. Their 620-mile journey began in Siberia. Yes, it was cold. Yes, it was dark. But man, was it treacherous. They had to fend off polar bears, dodge holes in the ice and battle the stress that comes with no sunlight for three months. But they made it... arriving at the North Pole this week. Melissa Block talks with them tonight from their tent just below the North Pole. Bundle up and check it out.